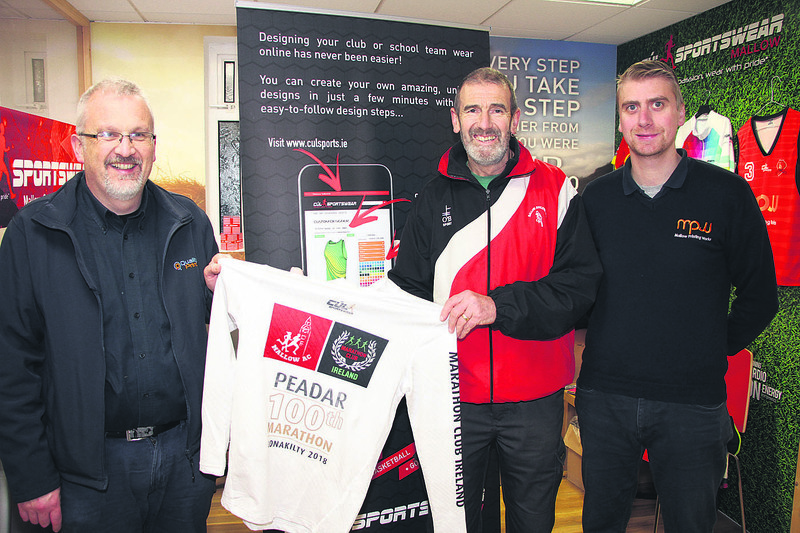 Peadar Curtis will run his 100th marathon this Saturday when he takes part in the 26.2 mile race in Clonakilty, and this week he was presented with a special 100th marathon shirt by John O’Sullivan and John Condren of Mallow Print. 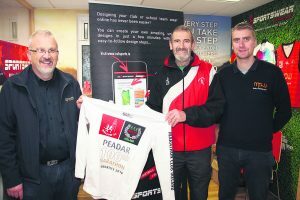 Marathon runner Peadar Curtis will reach a significant milestone this Saturday when he goes to the line for the Clonakilty Marathon, as he will be taking part in his 100th marathon, the first Mallow man to do so. To reach the century figure takes many years to achieve, and Peadar has been running an average of a marathon a month for several years. He has run every major 26.2 miler in Ireland, and a good number overseas too, and he has received good wishes from many runners this week, including members of Mallow AC, of which he is a member. And will he stop at 100? Highly unlikely, one imagines!